Five courses, 100 percent online. Get started in the GIS field with our online certificate program. 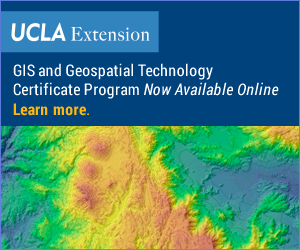 Visit our public geodata repository serving the UCLA campus and the world. Learn more about our professional programs in GIS and geospatial technology. Learn about our suite of free, open-access geospatial tools, including a free Web-based geocoder.